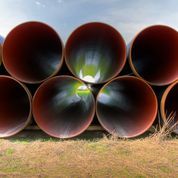 Worldwide Pipe & Supply stocks and supplies a complete inventory of carbon steel pipe including ERW (Electric Resistance Welded) and DSAW (Double-Submerged Arc Welded) pipes, ranging in size from 1/8 inch to 60 inch OD. Along with commodity grades and sizes, we can supply many odd-ball & hard-to-find sizes. Ask about our pipe beveling, grooving, painting and coating options.